BOSTON - Monday, May 8, 2017 - Solidifying his commitment to creating more affordable housing for residents in Boston, Mayor Martin J. Walsh today joined Codman Square NDC (CSNDC), City officials and neighborhood leaders to celebrate the grand opening of the Whittier Lyndhurst Washington homes. The $20.1 million redevelopment created 44 units of affordable rental housing and 1,000 square feet of commercial space on four sites in Dorchester's Codman Square. The City of Boston reported in their Housing Boston Two Year Snapshot that the City of Boston is currently on track to reach 53,000 new units by 2030, with more than 12,000 units of housing now completed and on line. "I'm proud the City of Boston's investment in this project has helped create 44 new homes for families in Dorchester," said Mayor Walsh. "This project shows us how effective we can be when we work together to preserve and create affordable housing, maintaining the special character of our neighborhoods. I am committed to making Boston a place for all families, and I want to thank our many partners who are helping us achieve our housing goals and brighter futures for Boston residents." Located in the heart of Codman Square, Whittier Lyndhurst Washington Homes includes the redevelopment of four sites and the renovation of 15 units of public housing at the Whittier School site; the creation of 13 new units of affordable rental housing and a community room adjacent to the School on Southern Avenue and Darlington Street; the renovation of eight units on Lyndhurst Street; and the creation of 1,000 square feet of commercial space with another eight new units at 472 Washington Street. The redevelopment entailed reclaiming a former gas station site at 472 Washington and the historic preservation of the Lyndhurst site, for which CSNDC received federal and state historic tax credits. The redevelopment utilized high efficiency heating and cooling systems and fixtures, as well as Energy Star rated appliances. Whittier Lyndhurst Washington employs environmentally-friendly design features throughout and will earn the distinction of being certified as LEED Homes Silver by the U.S. Green Building Council. The development will also meet the U.S. Environmental Protection Agency's Energy Star standards and Enterprise Green Communities standards. 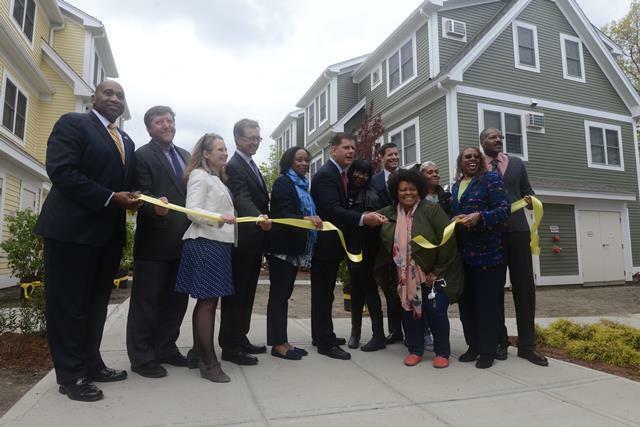 "CSNDC is thrilled to see Whittier Lyndhurst Washington, with 44 sustainable and affordable homes and 1,000 square feet of quality commercial space, come to fruition in Codman Square," said Gail Latimore, Executive Director of Codman Square Neighborhood Development Corporation. "We remain dedicated to anti-displacement and equity in our neighborhood and appreciate the past and continued support of our many funders." Codman Square Neighborhood Development Corporation and the Talbot Norfolk Triangle Neighbors United worked closely with the City of Boston to develop the homes in accordance with the goals and approaches of the Talbot-Norfolk Triangle Eco-Innovation District (TNT EID). The TNT EID is a grassroots, neighborhood-led effort and is a first of its kind approach to neighborhood-scale planning in the City of Boston in that it uses sustainability as a guide for planning and development. The Talbot Norfolk Triangle was the first EcoDistrict to be established in Boston and in 2014 won a City of Boston Greenovate Award. The City of Boston and the Boston Planning and Development Agency are working towards the establishment of more EcoDistricts in Boston as a step towards achieving Boston's ambitious greenhouse gas emissions reduction goals.